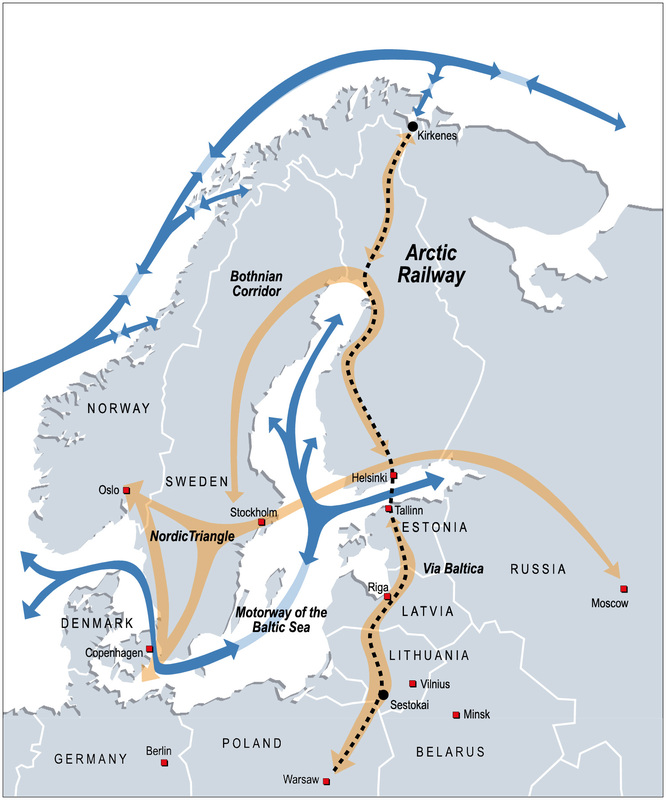 There is significant international interest in a potential railway between Rovaniemi, in Northern Finland, and Kirkenes, a port on Norway’s Arctic coast. But questions remain regarding whether or not it will be possible to realize the railway by 2030. The amount of cargo and the development of the Northern Sea Route are among the factors causing insecurity. Finland continues to pushing on to establish an Arctic railway, and the prospects for establishing such a railway were one of the key themes at the Arctic Business Forum in Finland this spring. Timo Leho, Development Manager of the North Laponia Region, is among those who know the project best. Last week, he gave a speech at the traditional Barents Conference in Tromsø, Norway. This year’s conference theme is “The Borderless Nordic,” emphasizing in particular how the necessary infrastructure, sustainable business and increased competitive advantages can be secured in the Barents region. A new Arctic railway — an idea supported on both sides of the Norwegian-Finnish border — is an obvious theme in this context. But how realistic are these visions? Will it be possible to realize such a railway by 2030, as Finnish transport authorities want? “It depends. At the moment, there is not enough cargo, however, if things change in the future then it might be possible. I know that the Finnish Minister of Transport wants it and that she wants to strengthen Finland’s position,” Leho says, referring to Minister Anne Berner. In Tromsø, Leho provided the conference participants with insight into the background for the plans as well as an overview over the current project status. Several studies have been done already, and others are ongoing. Finland is looking into different options when it comes to connections between the various railways. This study takes place on a regional level and is expected to be ready some time next year. “So far, there have been meetings with a series of stakeholders, among them reindeer herders,” Leho says. The Finnish-Norwegian working group was established earlier this year and had its first meeting in May. Next week, their second meeting takes place, this time in Rovaniemi. Representatives from Norwegian transport authorities, the Finnmark County Councilor and Bane Nor, the Norwegian state-owned company in charge of railway infrastructure, will all attend. Finding ‘acceptable’ places in which to build a new, Arctic railway line is a challenge. The goal is for the construction to have the least possible negative consequences for the various stakeholders. Potential compensations for those affected, for instance the Saami population, is also a key theme that needs to be resolved. The feasibility of the railway, given the amounts of cargo, is also a key element. “If there is enough cargo, there will be significant international interest in this,” says Leho, adding that this is closely related to many of the future project partners paying close attention to the development of the Northern Sea Route. Various estimates are made here, as well as in other contexts, indicate that the NSR will provide a 40 percent faster alternative for cargo transport between Asia and Europe when compared to the sea route through the Suez Canal. “The investors will want returns on their investments, of course,” he says. There is currently hard work going on from the Norwegian side, in particular in Sør-Varanger, on this project as well as on developing Kirkenes as a future hub for logistics. Last week, Sør-Varanger Utvikling [Sør-Varanger Development] launched a new, separate Norwegian home page for an Arctic Railway between Kirkenes and Rovaniemi. “We notice significant interest in the railway and have been strongly encouraged to continue the local process. Based on this, we see that there is a clear need for having a clear channel for gathering and disseminating information,” the development company says in a statement. During the fall and winter, a series of exploratory studies will be going on with both local and regional actors involved. The goal of the Arctic Railway web site is to publish news and updates about the further development of the project on a regular basis. This article was translated from the original Norwegian by Elisabeth Bergquist.